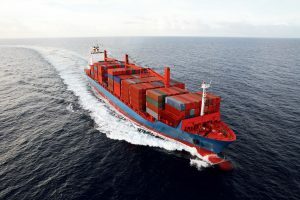 Which Incoterm is best for your sea freight transport? You are here: Home > News > Which Incoterm is best for your sea freight transport? Whether you are an experienced importer or not, the subject of Incoterms remains challenging. These delivery conditions govern the rights and obligations of both buyer and seller in the international goods transport process. Choosing the right Incoterm and proper coordination with the seller can prevent a lot of disputes and unnecessary costs. What are the most common Incoterms for sea freight and how can you choose the correct option? Each Incoterm has its own division of responsibilities for buyer and seller. This also includes a risk and cost profile. For this reason, it is important that the chosen Incoterm is already included at the quotation stage. This could make a big difference to the total costs you finally pay for your goods and the associated transport. Including a delivery condition in the sales agreement is particularly essential in view of cargo claims. Damage is a regular occurrence and inadequate or incorrect application of the Incoterms may mean the insurer will not pay out. 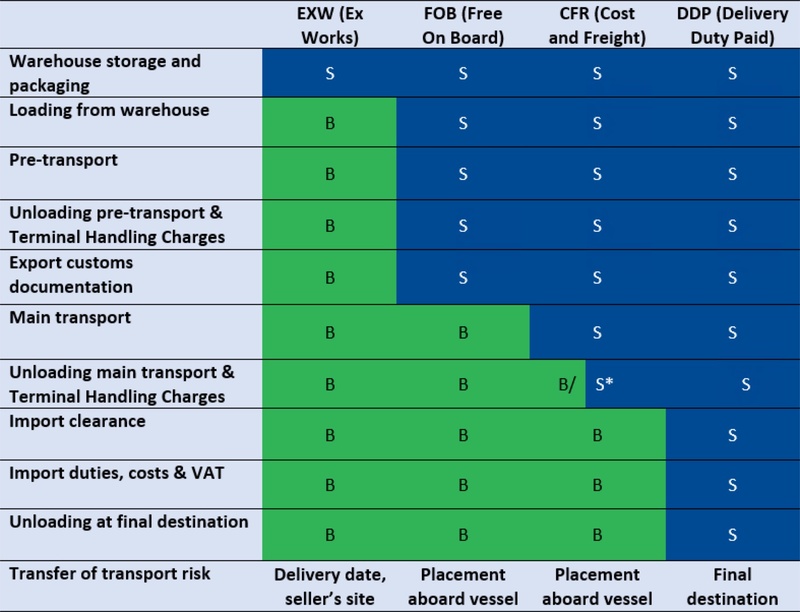 The most commonly used Incoterms for international sea freight are EXW, FOB, CFR and DDP. Simply put, FOB and EXW take account of the buyer’s interests. You can choose your own forwarder to organise (the main part of) the transport. The reverse is true for CFR and DDP. Here, the seller chooses the forwarder, who then arranges (the main part of) the transport. It is fair to say that EXW and FOB allow you more control over transport, planning and costs than CFR and DDP. This schedule is a simplified representation of the Incoterms. For all details involving the division of tasks and risks for Incoterms, please refer to the International Chamber of Commerce (ICC) website. Sellers often propose to include CFR as Incoterm in the sales agreement. This means all handling up to and including main transport are arranged by said seller. After this, the cargo is your responsibility. The disadvantage of CFR is that you have no control over which forwarder is used. You will be informed of the costs for main transport in advance and will often receive a good rate for this. However, this is usually not the case for the handling charges at the final destination. These charges can be extortionate, with the total cost ending up (unexpectedly) higher than if you had chosen EXW or FOB. Incoterm DDP means that the seller arranges the transport from door to door. This seems the simplest delivery condition for many importers, as the seller assumes all responsibility. However, DDP often has a sting in the tail when it comes to VAT payments and import duties. We see DDP cause complications in practical cases of customs forms on a regular basis, as well as unexpected extra costs. For this reason, we do not recommend DDP for goods originating from outside the EU. Just like DDP, the Incoterm EXW governs transport from door to door. The significant difference is that not the seller, but you – the buyer – are completely responsible for the entire route. You choose your own Dutch forwarder who will arrange the transport for you, from the factory to the final destination. To achieve this, Ritra Cargo works closely with reliable local agents in the country of origin who carry out all handling up to the main transport on our behalf. EXW is a particularly smart choice for importers who wish to subcontract everything to a single party. It allows for maximum control over transport, planning and costs. For a sales contract on the basis of FOB, you choose your own Dutch forwarder, who will arrange the main transport and all associated matters for you up to the delivery. Until the goods are on the vessel, your supplier is responsible for all required handling. You are often able to negotiate a better rate for these handling activities – in combination with the goods you buy from them – than you would for EXW. Therefore we recommend you include this in the quotation process so that you have a clear overview beforehand. FOB is a good choice for almost every importer due to the control over the (often lower) costs, the consignment and the planning. Incoterms EXW and FOB are often the best options for our customers. As they choose the forwarder themselves, the control over transport, planning and costs is with them. No nasty surprises in retrospect. You can determine which Incoterm is most suitable for you on the basis of the cost profile. In most cases, FOB will come out on top. If you choose to have us arrange transport for you, we will always provide you with a concise all-in tariff with a clear breakdown of all costs. Needless to say, a lot more goes into the import of goods. Think of transport insurance, clearance and physical distribution. We are available to give advice and support. For more information, please contact us without obligation. Also, we would be pleased to help if you have any further questions about Incoterms. This explanation is aimed at providing importers with the best advice on Incoterms for sea freight. However, no rights can be derived from this document, and you will always have final responsibility for the choice of an Incoterm. We recommend that you ensure you are well informed on Incoterms.